Hey Yall! 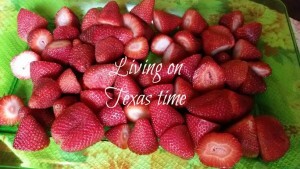 My name is Avery and I blog over at Living on Texas Time (www.livingontexastime.blogspot.com). I’m a stay at home mom and wife who loves my family, photography, Texas, the gym and the Lord. You will find any of these subjects discussed over on my blog, feel free to stop by and say ‘hi’! Recently we acquired a large amount of strawberries. Our grocery store had them marked WAY down so I bought a large container … followed by my mother in law giving us TWO more containers only a few days later. We had to act fast on these so they wouldn’t go bad. So I got to thinking a delicious and healthy snack. 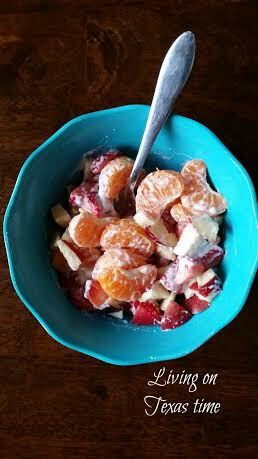 This snack does have a lot of fruit so maybe eat it in the morning or right after a work out. I know what you’re thinking…healthy marshmallows? We recently discovered a company called Walden Farms. Walden Farms puts out products that are calorie free, fat free, gluten free & sugar free. They have a large variety of dressings, barbecue sauces dips and syrups. So far we’ve tried quite a few of their products and liked them. One of the dips is called Marshmallow Dip. Sugar, gluten, calorie and fat free. All you need to do is mix together gently in bowl …and enjoy! 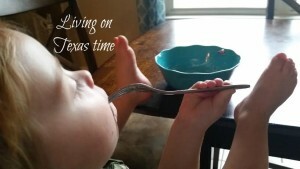 —————————————————————————————– That little one sure looks like he loved this salad! Thank you again for sharing this with us Avery. 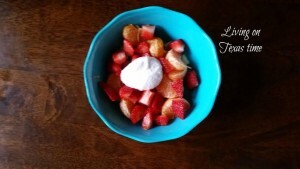 Go check out more yummy recipes from Avery on her blog.